Before leaping into buying a home on the Internet, consider this. When tax time rolls around, I sometimes think about the consequences of using TurboTax versus hiring a professional CPA, and how that kind of thinking also relates to home buyers who don’t want to hire a real estate agent. Some buyers think that finding homes online is so easy why bother with an agent. If you rely solely on buying a home on the Internet, it is guaranteed that you won't find every listing for sale. I’ve hired a CPA the past couple years and have watched our tax liability shrink incredibly before my very eyes. It makes me feel like I should have hired a CPA years ago. Saving a $400 tax preparation fee actually ended up costing me money in the long run when I could have saved ten times as much in taxes. It's a good idea to learn from other people's mistakes. Just as there are all kinds of ways to do your taxes, there are all kinds of ways to approach buying a home. But just as with taxes, it’s not always the best idea to do things on the cheap. 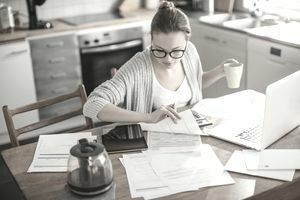 If you have one paycheck and no deductions — in other words, if things are simple — software like TurboTax or an online tool is probably fine. You also can use online tools to help with buying a home on the internet, and you’ll find some possibilities. But things are complicated in the world of buying a home today and, in complicated situations, hiring a professional agent or broker to help can make a huge difference. You can't rely on the Internet for everything, and buying a home on the Internet is almost impossible, although I'm certain mobile apps I haven't even heard of yet will make it seem easy because everybody is out to make a buck. Trying to buy a home on the Internet lets you quickly see a huge number of properties on the market, with some details about each and the asking price. It’s a good way to get a feel for the broad outlines of the market. If you know the area where you’re searching, you can quickly focus on a smaller group of properties. Most sites let you tailor a search to certain types of homes or certain areas. Some people are natural ‘do-it-yourselfers’ and are more comfortable doing their own research rather than working with a real estate agent. There are tradeoffs they might make that they won't realize unless they are conducting their own search. Online sites often list details of who is handling the sale, so you can follow up if you find a promising home. You might have to dig around in the listing to find it, but it is there. But there are pitfalls in a complicated market, and looking only online may leave you vulnerable to them. The number of homes on the market can be overwhelming. A real estate agent can help you quickly focus your search, especially if you don’t know a market very well. Some are neighborhood specialists and can tell you the differences between the homes on individual streets or blocks (including which ones are close to handy features such as schools, parks or all-night freight train lines). Online listings are only as good as the information that was input. Why does that house show up as three bedrooms when everything else around it has only two? Maybe because the third one used to be the garage? If the listing doesn’t show it, you don’t know it, but a buyer's agent can quickly do more research — and a good one already has. Not every home for sale, or every detail about it, is available online. An agent talks to other agents in the market. She may know that the price on a home is about to be reduced or that a brand new listing that is perfect for you is about to hit the market. Those deals don’t show up online until they happen, and then everybody knows about them. An experienced agent knows what other comparable homes are selling for, and can take more variables into account that many Web sites do. That can mean the difference between an offer that's rejected and one that's accepted, or the difference between paying the right price and paying too much. In a complex market rife with short sales and foreclosures, an online site can tell you what people are asking for their homes. It’s unlikely to tell you what prices banks are accepting for those homes. Contacting the real estate agent who is selling a home means you’re dealing with someone who has an interest in both sides of the deal; if you have your own agent, she represents your interests, not the sellers’. Only you can best judge whether buying a home on the Internet all by yourself will work for you, but consider the money you may save by hiring a pro. The good thing about hiring a buyer’s agent is it doesn’t cost you one dime more than going directly to the listing agent without representation. In fact, it could cost you big-time if you don't.